Home » Recipes » Pineapple Fried Rice to make Homemade Stir Fry Tonight! Pineapple Fried Rice to make Homemade Stir Fry Tonight! Pineapple fried rice is a homemade recipe that will make you want to stay in and chow down. Once you have the recipe down for this vegetable fried rice, you can add small pieces of chicken, pork, or even steak for a custom rice recipe that is all your own. Printable fried rice recipe at bottom of post. Our family LOVES rice. We eat it likely twice a week along side our proteins but often its a plain white steamed rice. The thing is I often over make rice, its just so easy to do! In my head I need two cups of uncooked rice but that yields SO much so I always have left overs. The good news is that if you have left over rice, cold rice makes the best easy fried rice so I wanted to share how we make it. Keep in mind that just about any recipe can be altered to taste, but soy sauce is notoriously salty, so skip adding too much salt or spices until you taste test your final flavors. You cannot take out soy sauce salt, so better to add than throw the whole batch in the sink. Easy Fried Rice Recipe to make Homemade Stir Fried Rice Tonight! 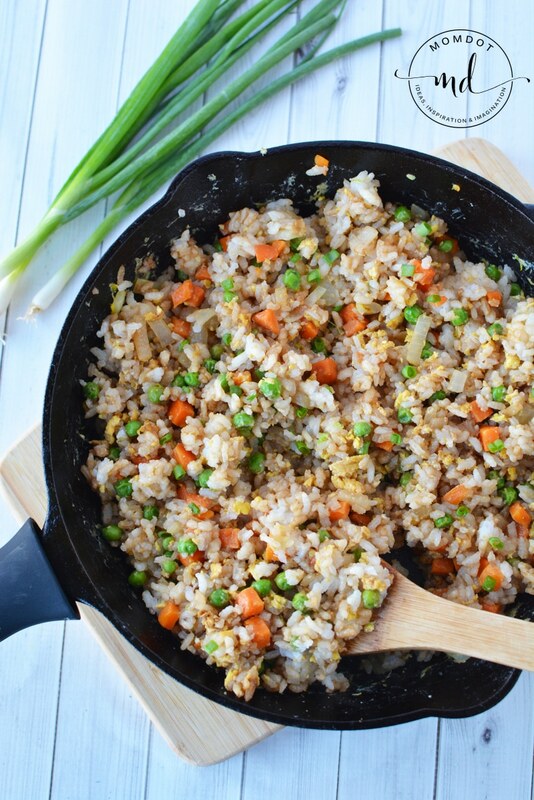 Before you get started on this vegetable fried rice recipe, make sure you pre-cook your rice. I like to use Jasmine rice . I believe it has the best flavor and fragrant of all the rices and its my go to for all dishes. I typically cook it in my rice maker. Because of that, it takes about 37 minutes to get done and I start with the rice prior to dinner time. Make sure you factor in this time so you finish your meal at the time you want. The rice cooker I use is located here or you can read my article on best small rice cookers and pick one. How do I make Stir Fry Rice? Making stir fry rice is so super simple that you will want to skip the take out every time and make homemade fried rice at least once a week. Add oil, onion, frozen peas and carrots to a skillet or wok I prefer a wok because it allows you to make quite a bit of fried rice and gives you plenty of space to work in. Note about making this dish: I personally like to add 2 tablespoons of butter with the oil but this is a taste preference. If you get your stir fried rice at a Japanese steak house you will note they also add butter to this dish. Heat up until onion is soft and vegetables are thawed and heated through. Add eggs and mix well, heating until they are cooked, scrambling them and putting them in small pieces as you go. A spatula works fine for this. Note: I believe that Jasmine rice is the BEST rice to cook with! Add rice and soy sauce and cook until heated through. Once egg is cooked, time to add pineapple! **To make this Pineapple Fried Rice, add your crushed or small pineapple chunks at the soy area. If you prefer not to, you can leave this out and its still an easy fried rice! You can also use FRESH Pineapple! Serve with chopped green onions if desired. Is Fried Rice Good for You? Well of course not. Its full of carbs and oils! But who cares? You eat fried rice because its DELICIOUS and there are a million other things that are worse. Just make sure you balance out your portions and stop with the guilt! What can you make with Fried Rice? 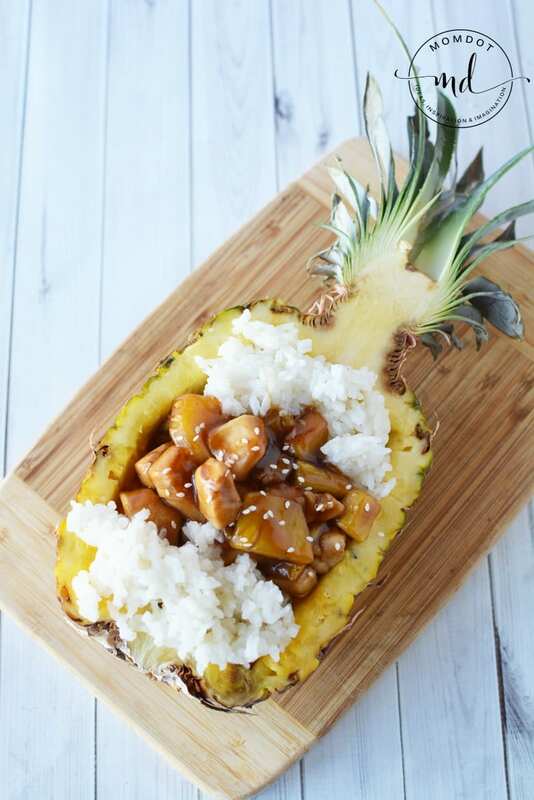 Honestly you can eat it alone but if you want to top your rice dish with some protein, I highly suggest this restaurant quality Pineapple Chicken Tenders, a perfect sweet balance. Or if you prefer, this Spicy Chicken Recipe or Teriyaki Chicken Fingers would also do the trick! All MomDot’s chicken breast recipes are located there so you can surf on whatever you are interested in having tonight (one of my favorite chicken recipes is this El Pollo Loco Copycat Chicken and these buffalo chicken sliders) . Yum! Pineapple homemade fried rice recipe that will make you want to stay in rather than take out permanently. 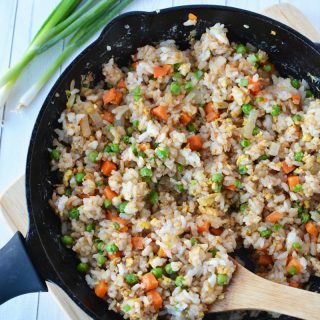 Once you have the recipe down for this vegetable fried rice, you can add small pieces of chicken, pork, or even steak for a custom recipe that is all your own. Add eggs and mix well, heating until they are cooked, scrambling them and putting them in small pieces as you go. A spatula works fine for this. Now add your pineapple chunks and stir. This is optional.